Lake Bled is Slovenia’s leading mountain resort and deserves at minimum a day trip visit from Ljubljana. Nature lover and hikers, however, would enjoy at least a three day stay if not longer. A whole day can be spent just around the area and many side trip excursions are sublime. If visiting Slovenia, this area should not be missed! We stayed at Hotel Triglav at Lake Bled for two nights. What a wonderful spot! It is perched atop a hill that provides magnificent views of the lake and its island below. Its Restaurant 1906, surrounded with windows for a spectacular view, serves a tremendous 4-course dinner which included cheese and nuts, pea soup, beef or fish, and a tasty dessert. Both the restaurant and the hotel are a delight. The walk from our hotel, down the stairs and around the Lake Bled is four miles. A portion of the walk is on a quiet road that the tourist train follows, but it also follows a shaded past pletna boat rental stations, villas, and resorts. I was short on time, so if I had to do it over again, I might have rented a bike to pass along the road quickly in order enjoy some of the idyllic spots with amazing views of the island a little longer. Pletna boats have been in use since the 17th century when the Habsburg Empress Maria Theresa granted the Milno villagers special permission to ferry visitors to the island which provided a much needed source of income to residents of the town who had very little access to farmland. The pletnas were, and still are, built by hand using a special design passed down from father to son just like the gondolas of Venice. The pletnas do not have a keel, so the oarsman has to work hard to steer the boat with each stroke. On the lake, there are 21 official pletnas that all belong to the same union. The oarsmen pool their earnings and divide them evenly after paying the tourist board. A pletna ride costs 12 Euros roundtrip which includes a 30-minute stay on the island. The island is home to the Church of Assumption. Ninety-nine steps lead from the dock to its door and grooms try to carry their brides to their wedding. The church costs 6 euro to enter. Along with the church is a café and souvenir shop which also houses an art gallery on its upper floor. Supposedly, it is the best souvenir shop in Bled. The best reason for visiting the 1,000 year old Bled Castle is for the sweeping views over Lake Bled, but the castle also has a history museum, a frescoed chapel, an old-fashioned printing press, and a wine cellar. The printing press is from Gutenberg’s time and tourists may use it to make souvenir certificates. Blejski Vintgar Gorge is just 2.5 miles north of Bled. While we had a car, it is reachable on foot, by bike or public bus. The entry fee to the gorge is only 4 euros and well worth it! Its boardwalk paths were recently damaged by Slovenia’s tough winter, so we were happy to find that repairs were completed just a few weeks prior to our arrival. The easily traversable boardwalks and bridges led us through spectacular terrain with low fog. Luscious, green vegetation grows on the gorge walls that tower above the turquoise river which carved its path. The walk took us past waterfalls and a stone bridge before we completed our 1.5 mile stroll through the gorge at a snack stand and WC’s. From here, we turned to the right and followed a path “Back to Bled” called Katarina. The path climbed through a forest before it opened up to a hill overlooking area villages below and the Bled Castle in the distance. We continued through wild-flower dotted meadows while passing through a variety of gates until we ended up back in the parking lot. This was a lovely, easy hike! Stasa and Domen, our guides, took us to a restaurant called Štrud’l near Lake Bohinj which serves local food including Žganci and Šmorn. Žganci is buckwheat mash and buttermilk served in two different bowls. Slovenians generally add the buckwheat mash into the entire bowl of buttermilk. We tourists generally added a few spoonfuls of buttermilk to our mash. We enjoyed Žganci as a starter rather than the normal full meal just so we could have a taste. After our main course of delicious barley soup we tried Šmorn for dessert. Thicker than a funnel cake, smorn is similar to torn up Indian fry bread topped with powdered sugar and jam. It was spectacular! I could have eaten the entire plate for four people. The legend goes a cook was making a cake for an Austrian emperor and didn’t like how it came out, so he tore it up. I’m thankful for the tasty mistake! Lake Bohinj is located 16 miles southwest of Lake Bled. The lake offers a quieter scene with less commercialization than Lake Bled. Our tour guide, Domen, likes Lake Bohinj and its views of Slovenia’s famous Mt. Triglav even more than Lake Bled. For serenity, I could see how that would be the case. Domen led us to a trailhead that started just off a back road and next to someone’s home. We certainly wouldn’t have found this quiet path that did not start in town but eventually led us to Ribčev Laz Village. We followed a path that led us through open meadows peppered with wildflowers and home to a traditional hayrack. Slatted fences covered with a narrow roof are used to keep hay dry from the frequent rainfall. The traditional hayracks were abandoned with the building of warehouses, but have since been reestablished as a symbol of Slovenia’s history. While there are the small, simple narrow ones, there are also elaborate ones that act more as storage for firewood and a tractor. 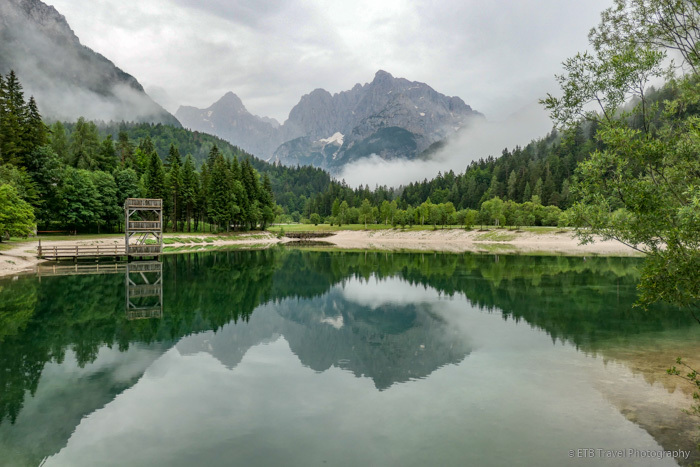 After wandering through the meadow, we found the shores of the lake shaded by large trees which offered lovely views of the Julian Alps. From the lakeshore, we continued on a forested path until we reached town where we were shuttled back to Lake Bled for a delicious dinner. About the only time the rain interfered with our two weeks of travel through Croatia, Slovenia and Italy was during dinner at Penzion Berc. We started out on the patio adorned with bright red flowers when the threatening thunder sent us inside. The staff did a superb job getting a large table together for us quickly just before the downpour. With that being the worst of the weather, we felt very lucky given all of our outdoor activities. Our meal at Penzion Berc was excellent and included mushroom soup, beef pasta, and decadent desserts. Our drive to Vršič Pass first took us to Jasna Lake just outside Kranska Gora. We enjoyed a short stroll on a cool morning while admiring mountain reflections on the placid lake. The lake is also home to a bronze of a Zlatorog (or Golden Horn), a beloved mythical creature. Ajda, a village girl correctly predicted its death and was cursed by the townspeople and whose ghostly face can be seen on the mountains near switchback #22 on the road mentioned below. From here, we followed the signs for Vršič, part of Triglav National Park. The road to Vršič Pass includes 50 hairpin turns (24 up and 26 down). Each one is numbered and labeled with the altitude. We decided each turn was numbered for an unfortunate cyclist or driver who didn’t make all the turns, though apparently buses can make the drive on the narrow road, so perhaps the perceived danger isn’t too bad. There are pull offs along the way, though we only stopped at the summit for remarkable views of the surrounding mountain range. The road was built during World War I by at least 10,000 Russian POWs of the Austro-Hungarian Empire to supply the Soča Front. Many POW’s died in terrible conditions and hundreds more were killed in an avalanche while working on the road on March 8, 1916. A Russian Orthodox Chapel is built where the casualty was found near switchback #8. The way down to Soča River Valley is marked with WWI remnants such as a guard tunnel near swithback #28. The Soča River Valley is another special place with significant WWI history and super scenery. More on the Soča River Valley may be found in the next post. The gorge is so pretty! Breathtaking photos and interesting itinerary. We’re going in August and wanted to do some of the same activities. How did you find your local guides?